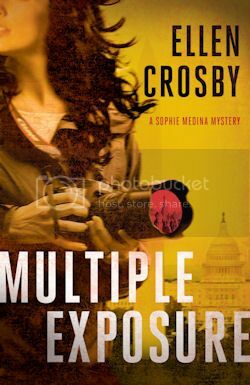 Multiple Exposure by Ellen Crosby is the author’s first novel in the new “Sophie Medina Mystery” series. The main character is Sophie Medina who is a photojournalist who finds herself in the middle of conspiracies, international politics, and much more. “When photojournalist Sophie Medina returns to London from an overseas assignment, she discovers that her husband, Nick, a geologist and covert CIA operative, has been abducted. Three months later she is shocked when a friend in the British government says Nick has been spotted in Moscow and is not only a suspect in his boss’s murder but also potentially involved in illicit Russian oil deals. With her every step now closely watched, Sophie moves to Washington, D.C., to be with her family and friends. There, Sophie is drawn deeper into Nick’s shadowy world. While photographing an exhibit of two never-before-seen Fabergé imperial eggs at the National Gallery of Art, Sophie is confronted by a Russian oil tycoon, implicating her husband in an international energy scheme. On the run from Nick’s enemies, Sophie plays a high-stakes game of Russian roulette as she tries to determine friend from foe and prove her husband’s innocence. Multiple Exposure is a suspenseful mystery novel that I really enjoyed reading. The author did a really fabulous job with her character crafting, and I absolutely want more from Sophie Medina. Thankfully, this is a new series, so we can continue to read more about her. Her missing husband is also a big part of the story, but his working for the CIA is of course a big part of the political drama that Sophie ends up having to face as well. The backstory to the character, and essentially, the series, is a little bit slow. However, I think that it works out well overall and includes essential information that the reader needs to fully engross themselves in the series. After the backstory melds into the current situations, it moves quickly and is a breeze to read through. The pace is just right, and at least for me, kept me up late to finish. Overall, I really enjoyed this novel. The author writes in a very flowing manner that makes it an easy and fun read. I can’t wait to read more from this series, and the author. I definitely recommend it. * Thank you to the publisher of Multiple Exposure, Scribner, for providing me with a copy of this book for review. All opinions expressed are my own.